Secretary-General António Guterres (left) and Prime Minister Shinzo Abe of Japan brief the media at a joint press conference in Tokyo. In mid-June, US President Donald Trump and North Korean leader Kim Jong-un held a historic summit in Singapore, signing a joint statement which included a pledge to end DPRK’s nuclear weapons programme. Days after conducting its sixth nuclear test last September, a North Korean ballistic missile flew over mainland Japan, drawing condemnation from the Security Council, which had just ratcheted up sanctions. Standing alongside the Japanese leader, Mr. Guterres went on to express his support for Japan’s willingness to hold fresh talks with the North Korean leadership, following Prime Minister Abe’s offer of a high-level summit with the country. The Secretary-General travelled to Nagasaki later on Wednesday, where he was due to meet Mayor Tomihisa Taue, and other local officials, as well as with some hibakusha, or survivors of the atomic bombs. On Thursday, he visits the Nagasaki Atomic Bomb Museum and the Nagasaki National Peace Memorial Hall for the Atomic Bomb Victims, before taking part in the 73rd Nagasaki Peace Ceremony. 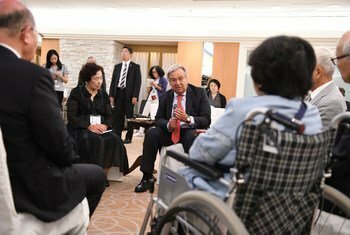 Secretary-General António Guterres meets with survivors of the atomic bomb attacks on Nagasaki and Hiroshima. 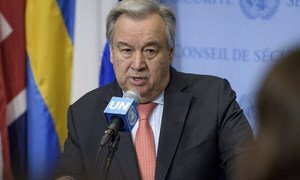 The summit between the leaders of the United States and the Democratic People’s Republic of Korea (DPRK) is “a promising development for global peace and security,” United Nations Secretary-General António Guterres said on Monday.